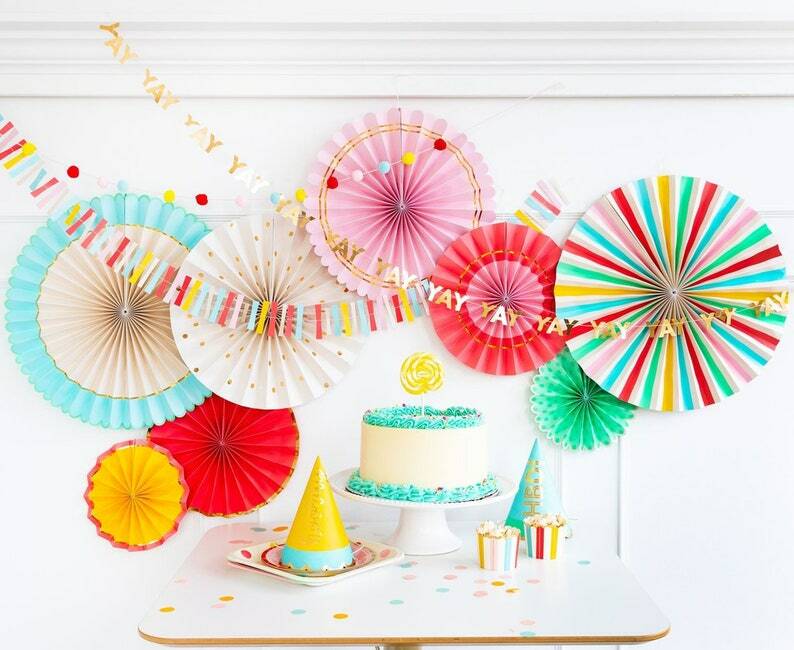 These Party Fans make such a beautiful and whimsical backdrop to any special event! They are sure to make a statement and accent any room or wall with their Bright & Vibrant colors and textures. Use for a Candy Buffet Bar, Wedding backdrop, Bridal, Baby shower or Nursery decor or just to brighten any room in your house! ****The set of fans will arrive pre-folded. While placing the fan on a flat surface, carefully remove the adhesive strip and open the fan into a full circle, adhere the end pieces together and use a paper clip near the outside edge of the back to add stability (the paperclips are a great option if you are wanting to reuse these fans). Please handle carefully to avoid damaging the adhesive center. Each fan also has a small thread loop and can easily be hung from the ceiling or a tall windowpane. The fans can also be adhered to a wall using the removable adhesive stripes on the back, brad nails, staples or push pins. Use slight pressure to attach adhesive to the fan, then attach the fan to the wall.